Rachel G. She has been my personal body guru since October of 2012 in Maui, Hawaii. My ritual Included attending her Yogalaties class. It’s the perfect combination of profoundly therapeutic yoga and pilates. I then would follow that up by receiving permanent body art. When designing my tattoo I met up with Rachel to discuss the core ideas that I had. She took some of my basic drawings and jotted down notes and created her version of it. I love what she has designed! I really felt like she understands my vision and was able to interpret it with ease. The tree of life has always resonated with me. I chose it as the basic idea behind the tattoo. The crown of the tree is the sacred geometry flower of life. The core of the tree has a sacred geometry tree of life and the roots are in a Celtic knot. Blending through the branches you find deer antlers in honor of my father. Wrapping around the roots are feathers. The 3 feathers represent family. On Maui we put 6 hours into my tattoo. It’s been 3 sessions of 2 hours. This May 2017 I was able to serendipitously reunite with Rachel G in Homer, Alaska at her shop on the Spit. It’s a breathtaking location. We added 4 more hours of detailed work to my tattoo. 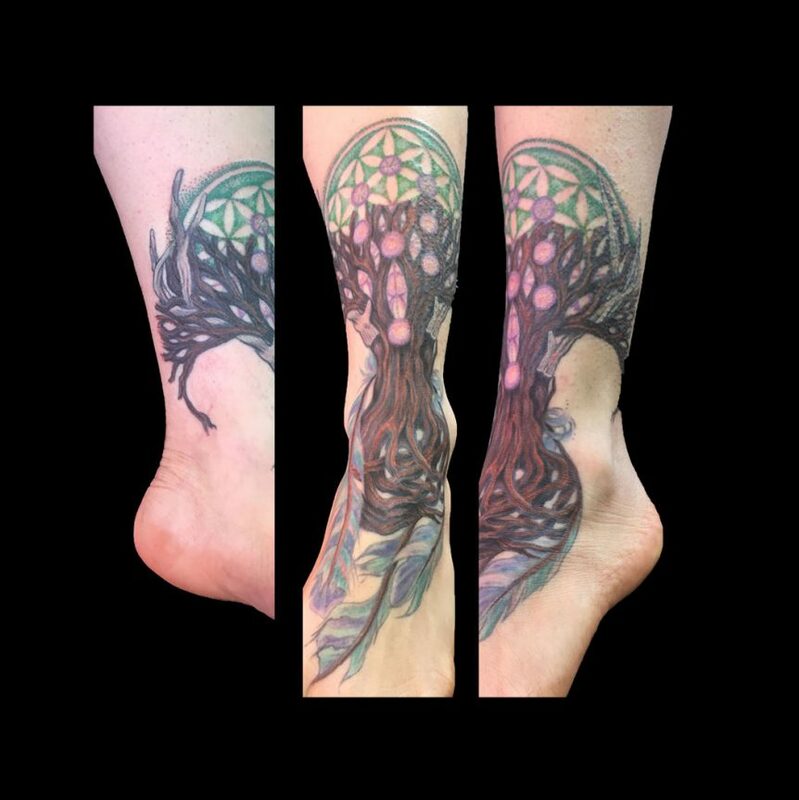 I am so pleased with it across the board, and feel that giving her creative freedom to create my one of a kind permanent body art piece really allowed it to come to life. I’m already planning our next appointment at the end of my season working at Tutka Bay lodge as massage therapist and yoga instructor for Within the Wild Adventure Co. My season started at their Winterlake lodge on the Iditarod trail. February I arrived to Alaska and have truly fallen in love with it here. One day I’m dog mushing, and the next I’m enjoying Kachemak Bays majestic beauty from Rachel G’s Exotic Eye Tattoo Shop. Life is a beautiful thing. After getting your tattoo by Rachel make sure to stop in at La Baleine Cafe on the Spit for a bite to eat with award winning chef Mandy Dixon. Her family owns Within the Wild Adventure Co which is known around the world as being a National Geographic Destination lodge where you can enjoy gourmet cuisine by Kirsten and Mandy Dixon.